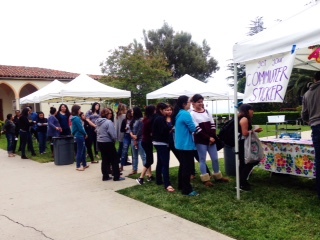 On Tuesday April 21, commuter students enjoyed Hawaiian food and flower leis on the lawn with Bob Marley’s “Three Little Birds” playing in the background. Students line up for their share of Hawaiian food. 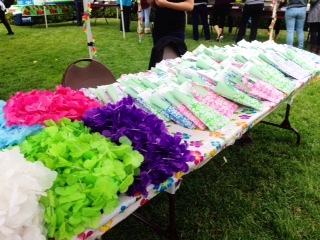 Student Programming and Commuter Services held its annual commuter appreciation event and this year’s theme was luau. Vanessa Gomez, Nursing student and Commuter Program Coordinator for SPCS, shared that because of all the beautiful luau decorations, organizing the event was just as fun as the outcome. “Most Commuter Appreciation events are the most successful on campus because we offer meals, not just snacks and commuters really appreciate that,” Gomez said. SPCS hands out Hawaiian flower leis and a kit for final exams. Delicious Hawaiian food and soft drinks, free of charge, from Rutt’s Cafe, were served. SPCS handed out Hawaiian flower leis and a kit with a Scranton form, green book, flash cards, a pencil and a pen for final exams. SPCS would like to thank every participant and hopes to see more students at their next Commuter Appreciation gathering.